The word 'safety' or even worse the words 'health and safety' often conjure up thoughts of benign, de-risked and un-adventurous activities. Whilst that's often true in the workplace, safety in the outdoors is merely the compounding effect of understanding your environment, having a planned response to 'likely' challenging scenarios and appropriate equipment choices ensuring that you can deal with all mother nature may throw at you. Seriously hurting yourself or finding somebody in a bad way in the middle of nowhere isn't much fun and can lead to the worst possible outcome. Carrying the correct equipment, a basic understanding of what to do and the confidence to make the right call will make all the difference when dealing with injuries or a worsening situation. This approach will also allow you to go further, harder and in more challenging conditions enhancing your enjoyment and experience of the outdoors safely in the knowledge that you can deal with most scenarios. Below is a golf bag of safety considerations/equipment which have kept me safe, comfortable and happy outdoors for years. Headtorch - Dark hours use, emergency signalling and additional bike light. Tinder - Not the dating app! I keep a tampon in my first aid kit. It provides waterproofed tinder to get wet wood burning but is also an additional sterile dressing materials for a wound. Photo ID - Some hotels and hostels require ID. Also in the event of an accident the emergency services will be able to work out who you are and how to contact family. Credit Card/Cash - You may find that some shops, pubs and hostels in more remote locations don't take cards so always worth having a few notes stashed in your kit. Spare Batteries - Get in the habit of carrying spare batteries for your electronics. Try and buy electronics that take the same battery size. Emergency Nutrition - Bury a couple of energy gels and a muesli bar in your pack. They'll be 'nectar' when you need them. Bright Colours - If you wear dark coloured clothing you will be difficult to see and therefore find. You would be amazed how dark and natural colours disappear into the side of a mountain. Bright colours 'pop' on the side of a mountain and will be picked up quickly by those loooking for you. Warm Kit - Depending on how long you are going to be out you should always carry warm kit in the event that you have to stop for any period, the weather turns or you have an emergency. I normally carry a warm hat, buff and jacket (fleece or down dependent on how long I am out). If you are going to be out overnight or for longer I will take some leggings or trousers. Layering - You might assume that if you get cold, putting on a warm jacket will solve all of your problems, but, it's more likely that as as your workrate increases you will get too hot and really sweaty. I normally adopt a process of thin layers typically consisting of a base layer (or cycle top), merino long sleeve top (half zip for extra ventilation), pertex jacket (windproof very lightweight) and finally a waterproof jacket. These can be augmented with arm/leg warmers and a buff for really cold weather. I have found that the process of layering up/down keeps you at a comfortable temperature and stops your layers getting damp with sweat. Remember that you lose lots of warmth from your head and neck, on your 'short stops' try putting a hat on rather than wasting time pulling layers out of your pack. Waterproofing - It's important that any equipment or clothing that needs to stay dry is adequately waterproofed. I tend to use a heavier duty canoe bag for the main compartment of your pack and then lightweight canoe bags or plastic bags as a way of organising and further proofing. Also your waterproof clothing, boots and equipment need to be re-proofed periodically otherwise they will fail when you need them most! Ideally you should try and organise your kit inside your pack(s), if you have seperated kit into seperate dry bags that will make this process easier. The key principle is to keep the things you need during the day at the top or in easy to access pockets, this minimises time wasted during the day emptying the contents of your pack on the ground where it can get wet or disappear into the grass. Once you have found a packing order/style that works for you get in the habit of keeping the same kit in the same place, this will make you more more efficiently as you spend less time rooting around in your gear for your haribo! You might wonder why bike tools and equipment would be considered safety equipment? Well... bike will get you into isolated country quickly, often wearing shorts and cycle shirt carrying minimal kit. If you where to consider the same day out on foot you would undoubtedly take more kit; possibly a stove, warm kit and an emergency shelter. Yet on a bike we are happy to head out in a cycle shirt, shorts and footwear you wouldn't want to walk back in! However, 'we' cyclists are terrible weight weenies always looking for the lightest kit! Light kit always comes with a penalty, often this is how effective it is at serving its purpose. A good example is your tyre pump, as tyre sizes increase the ability of lightweight/compact pumps to inflate the tyre diminishes keeping you and your mates static whilst getting colder! Multitool - Get one with allen, hex, phillips, flathead and a chainbreaker as a minimum. Buy a decent quality one as the cheaper ones will often fall apart and are made from cheaper metal alloys that often break and round off becoming useless. Patches - Self adhesive are best especially when you are repairing a puntcure in the rain. I carry a couple of packs. Inner Tubes - At least one.. if you ride tubeless or not. Tyre Levers - A lot of tyres are hard to get on/off rims these days. Carry a solid set as flimsy ones will snap (Pedros are excellent). Chain Links (Quicklinks) - Make sure you have the right speed. 1,9,10, 11 or 12 speed. Tyre Boot - Cut an old toothpaste tube into a square. Can be used as a tyre boot to get you home with a slashed tyre. Pump - A small pump might be light but try pumping up a 2.4" 29er up with it when you are cold, wet and tired! Map - hard and soft copy. Technology can be brilliant, the ability to store 1:25K and 1:50K mapping of large areas on a phone is a great tool. Map Case - A paper map will disintegrate very quickly when it gets wet and becomes fragile when damp. Compass - You should understands the basics of how to use a compass such as orientating you and your map to north and walking on a bearing. 2 basic navigational skills that will ensure your safety. GPS - This should be a navigational aide, something you use to check your location when disorientated. 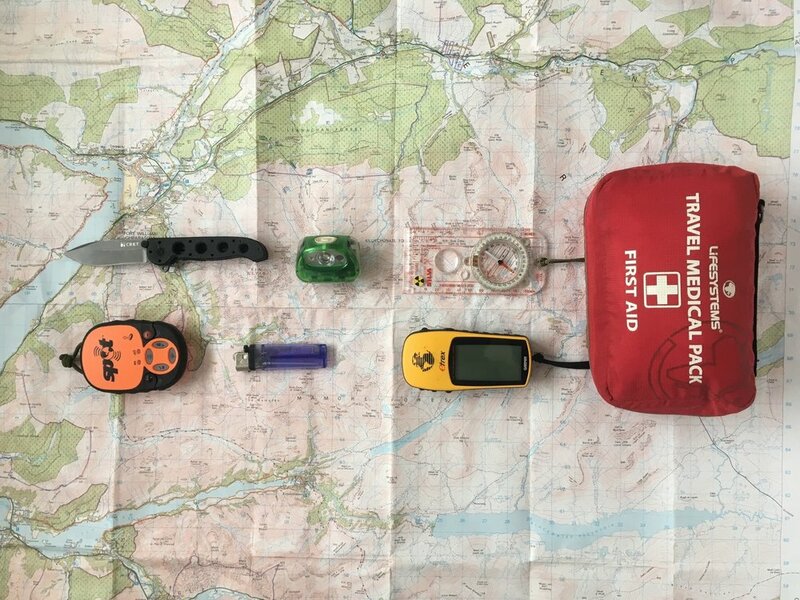 Build up your skills with a map and compass, you can use the GPS when you become geographically embarrased. Planned Routes, RVs & Escape Routes - Before you head out have a look at the quickest routes to safety along your planned route and some emergency RVs where friends, family or emergency services could assist in the event you have a problem. Smart Phone / Mapping - The technology smart phones offer the outdoor user is amazing. The combination of a GPS, mapping, torch, ebook and phone makes it the perfect travelling companion. Make sure you get a decent waterproof case to look after it otherwise it becomes an expensive paperweight! Satellite Tracker/Beacon - These have become cheap, lightweight and robust. All have an SOS function and as long as you can guarantee line of sight to the sky will work and confirm message sent to the emergency services. I use a Spot Messenger, it has a relatively inexpensive annual subscription and emergency insurance options. I have used them across Europe, Africa, the Middle East and New Zealand with no problems. Satellite Phone - Depending on what you are doing and where you are doing you may find one useful. They are expensive, bulky and need to be charged so less than ideal for lightweight movement. The pre-pay packages are often the best value for the occasional user and there are companies who will provide turnkey rental packages. Batteries & Chargers - So many options... I use a mix of dynamo hub, solar charging and a USB power bank for Iphone and Ipad. Equally your laptop battery can be used to recharge small USB devices on longer trips. For battery powered devices I stick to AAA battery operated devices, saves messing around with different size batteries and they're smaller than AAs. Emergency Shelter - You can buy an Emergency Bothy, very useful when you are operating in exposed terrain in wet weather. I have carried one but never had to use it in anger, they will be a lifesaver when the weather turns and you need a controlled environment to deal with an injury, reassess you location or get out of the weather to eat or drink. If you are in an area with trees, walls or fencing a tarp could achive the same effect. Bivvi - These are a great no nonsense piece of kit. They are quick to pitch, simple, compact, light, easy to clean/dry and don't suffer condensation issues as badly as a tent does. The draw back is no buffer between the outdoors and the inside of the bivvi, which means water can be introduced into the bivvi easily in wet weather. This can be mitigated with the use of a tarp or pitching it in a covered area. Unless you get a bivvi with a fly net you will suffer in midgy and mozzy country. Tarp - Another simple and highly effective piece of kit. When used with a bivvi bag this makes for a lighweight, robust and simple piece of shelter in the most inclement of weather. Tent - There are some amazing tents on the market and you can spend as much money as you want. If you need to bolt down the hatches and wait out the weather or for rescue in relative comfort a tent is the piece of kit for you. Issues with a tent for consideration are the build up of condensation and rep itching a wet tent in wet weather ( a truly miserable experience!). If you're only out for a short time and clean water is readily available, life is easy! If you are out for longer periods you need to plan forward; assess the ground in front of you, understand where drinkable water is likely to be available and manage your water accordingly. In 'high country' clean running water is readily available, however, at certain times of year and in some countries water can be scarce and require processing. In the UK we are spoilt for clean, drinkable running water in the hills and mountains. My rule of thumb for drinking untreated water is that it should be clear, running and you can see most of the ground to its source being clear of anything that may contaminate it. In the event you have to santise the water the following methods can be used. Filter - There are lots of water filters on the market. UV - You can purchase portable UV lights or use natural light if you have a clear bottle (leave standing in a clear bottle for 30 minutes in direct sunlight). Chemical - Iodine of chlorine tablets. Boiling - Pre-filter the water using some fabric to clear larger debris then leave the water to stand allowing sediment etc to settle. You need to boil the water for at least a couple of minutes to be sure you have killed any waterborne pathogens. There are so many safety considerations when operating in and around water. Quite often the more inviting and safe the water looks the more dangerous it can be. I can't cover all of the considerations you should take into account but can provide some basic safety considerations that will make the water safer. Water Movement - You should understand the effect that wind, tides, currents and flow rates have on the water you intend to cross or swim. Once you are in the water or past the point of no return underestimating any of the above will potentially kill you. Never try and fight the water movement always try and use that movement to support your aim! Temperature - Cold water is a killer, if you are going to be immersed in water for a while ensure you can either get out quickly if you start to feel the cold or have a means to insulate yourself from the cold. Buoyancy - Unless you are a purist or swimming in safe water having a buouyancy aide can increase your enjoyment and ability to remain in the water. There are numerous ways this can be achieved; wetsuit, neoprene vest, buoyancy aide, inflated canoe bag and pretty much anything you can inflate that will hold air. This includes your trousers with the legs knotted! Visibility - It's important that other water users can see you, you can become 'invisible' in choppy water or when visibility is reduced by fog or sun strike. Increased visibility/profile can be achieved with contrasting and bright coloured clothing/equipment or the use of a swimming safety buoy. Supervision - If you are lucky enough to have somebody that will paddle a canoe or SUP with you it will provide a much safer swim. If you want to cross a large body of water ideally you should have somebody above the water on hand to assist you and warn others of your presence in the water. Its also quite nice to have a chat with somebody at a stunning view point in the water, take a breather or enjoy a sip of hot tea! Where to swim? - When I swim on my own, I swim along a shoreline increasing the odds of getting to shallow water I can stand in and possible assistance from the shoreline. Safety in Numbers! - The larger your group is the better. It will increase you signature and profile in the water whilst ensuring an enhanced ability to respond to any given scenario. Weather Reports - These should be checked in the build up to your trip and confirmed immediately prior to departure. You also need to constantly eyeball your horizons for any change in weather whilst our on the ground, depending on where you are you might need to react immediately to a sudden change in weather to stay safe. Hot - Keep hydrated drinking little and often, replace salts lost with electrolytes, slap on the sun screen as when sun burnt your skin loses more fluids through evaporation, use shade to your advantage when available, cover up and monitor for signs of heat injury as they can come on rapidly. Cold - Understand where the closest shelter is in the event you need it, layer up as required and try to stay dry(ish), warm food and monitor for signs of cold injury. Remember when you get wet your body will lose heat '25 times' faster! Environment - Weather extremes have different effects on your environment. Heat reduces water availability, increases the risk of sun burn, heat injury and fire risk. Wet and cold conditions increase the risk of cold injury, flooding and treachorous ground. Does anybody know that you are out there? Unless somebody knows that you are in the hills or in the water nobody will be able to alert the emergency services if you don't return. Best practise is to leave a route card and expected return time with somebody, remember to let them know when you get back in or you maybe responsible for rescue teams being uneccesarily deployed and risking their own safety! Worst case; if you don't leave a detailed route card let somebody know where you are going and when you expect to return. This can be achieved with a quick text message, a 10 second job! A first aid kit full of plasters is going to be useless if your pedal takes a huge chunk out of your shin. Take a first aid kit with the right stuff in it for you and the activities you take part in. Antihistamines are a useful addition as everybody seems to have allergies these days. Make your kit specific for a trip.... small, medium and large if you are taking a group out!! It isn't much use if you have a first aid kit and don't know how to use it. There are numerous online resources which will increase your understanding of how to deal with injuries but they're no substitute for training. There will be numerous courses in your local area some may even be free, some you can volunteer for through your place of work and some fee paying. They vary from basic health & safety in the workplace to more advanced courses such as mountain first aid. Having completed military and civilian medical training courses I can vouch for their value as I've used the skills and knowledge on myself, colleagues, friends and strangers to good effect! This article was written and published by Darroch Davidson on wildswimbikerun.com, provider of bikepacking, mountain bike, road cycling and triathlon holidays in the UK and New Zealand.